What causes allergies and asthma? Posted in Health & Wellness on July 22, 2010. Last modified on March 28, 2019. Read disclaimer. Do you find yourself suffering from runny or clogged nose, sneezing, itchy eyes, nose or throat, rashes, wheezing, coughing and postnasal drip or trouble breathing? You may be one of the 50% of all Americans who test positive for allergies or suffer from asthma. Ideally, harmless environments substances would go unnoticed. In many people, however, they trigger an over response by the immune system (similar to what occurs when the body is invaded by bacteria or viruses). Inflammation and histamine are produced and a series of uncomfortable and even life-threatening conditions can result. Allergies are an overreaction by the body's immune system to substances that most of us find harmless. While it is generally not possible to prevent allergies, it is possible to control them by minimizing one's allergic reaction by: 1) avoiding the offending allergens and 2) minimizing symptoms either through medication or allergy shots/treatment. Asthma is a chronic disease where the airways (the tubes that carry air in and out the lungs) become inflamed and sensitive. Persons with asthma have it all the time --but breathing irritants can trigger an asthma attack or asthma episode where the airways narrow, making it difficult for air to flow. Symptoms include wheezing, coughing and difficulty breathing, tightness of the chest. Asthma attack triggers include common allergens as well as cold, flu and other respiratory infections, acid reflux, physical exertion, weather conditions, strong, emotional reactions, and certain foods. In addition to avoiding common asthma triggers, treatment may include medications, either by inhaler or pill form, for both quick-relief and long-term control. Mold spores, whether outdoor or indoors on wallpaper, in carpets and upholstery, etc. Why are only some of us affected by allergies? There is a strong genetic component (children have a 30% chance of suffering from allergies if one parent also has allergies. The tendency jumps to 70% when both parents are positive for allergies). 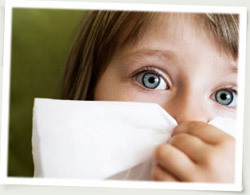 Other possible factors include exposure to allergens when body is weakened (such as after a viral infection or during pregnancy), the hygiene hypothesis (that we have become so conscious of cleanliness that many infants are no longer being exposed "normally" to viruses, bacteria and other allergens, and thus their bodies are not being trained how to properly recognize and manage them), as well as nothing more than simple, common exposure. For instance allergies to animals can take 2 years or longer to develop. Complete avoidance of offending substances is nearly impossible. (Ragweed pollen, for example, has been detected 400 miles out to sea and 2 miles high in the air). And moving to a different area of the country may provide only temporary relief. While symptoms may go away for a year or two, they often reappear as people develop allergies to the specific pollens or other allergens in the new local. Cover your bed mattress and pillows in "dust proof" covers and wash bedding once a week in hot water. Keep stuffed animals and pets out of the bedroom. Sweep floors and vacuum carpets often to minimize dust mites (if possible, even remove all carpets). You may want to wear a mask while cleaning and leave the home for a few hours afterwards until any dust left behind has settled. Try to keep home humidity level between 35-50%. A humidifier can minimize discomfort by moistening very dry air while a dehumidifier or air conditioner may minimize mold-generating dampness. Speaking of mold, having house plants can increase indoor levels of pollens and molds. Open a bathroom window or run the exhaust fan when showering. Cleanliness is crucial to preventing roaches and other pests. Avoid exposure to second-hand smoke. Keep windows and doors closed and use a clean, high-quality filter in your home air conditioner and furnace. Supplement this with a portable HEPA (high efficiency) filters in rooms where you spend a lot of time. According to the International Archives or Allergy and Immunology, nasal rinsing with a mild saline solution can be an inexpensive and substantial way to help clear the nasal passages of allergens and irritants. And it is something you can safely do 2-3 times a day throughout the allergy season. In fact, the greatest benefits may take 6-8 weeks of consistent use before maximum benefits are realized. Neti pot, bulb syringe and squeeze bottle devices are available at most drug stores to make nasal rinsing easier. Nutritional supplements and herbs that may help reduce inflammation and allergy symptoms include probiotics (like the type found in yogurt), quercetin (a compound that gives the color to fruits and vegetables), spirulina (a type of algae), vitamin C, butterbur herb, stinging nettles and astragalus. Check with your healthcare provider before taking any herbs or supplements, however, since some are not recommended for children, pregnant women, breastfeeding mothers or persons taking medications. Minimize time spent outdoors on dry, windy days or when the forecast calls for high pollen counts. (Highest pollen counts typically occur between 10 am to 4 pm.) If you know that allergen exposure will be high on certain days, you may be advised to start taking your allergy medications before symptoms start. Avoid lawn mowing, weed pulling and other chores that stir up pollen. If avoidance is impossible, at least wear a mask. Change clothes after outdoor activities and shower and shampoo to remove allergens from your skin and hair. Use your laundry dryer rather than hanging clothes outside where they can pick up pollen. When trying the various options above, remember that the body needs time to recover from an allergy attack before it can prevent future occurrences. There is no doubt that allergies and asthma symptoms have the potential to overwhelm a person's life. When the tips suggested above don't offer enough relief, see your doctor. He or she may recommend prescription or over-the-counter antihistamines (to alleviate runny nose, itchy or watery eyes, sneezing and other allergy symptoms), decongestants (for relief of sinus congestion), nasal corticosteroid spray (to reduce nasal inflammation along with sneezing, itching and runny nose) or other medication or treatments.